The official launch of the 2018 YP Art Exhibition was held on Thursday 26th October. The YP Art Exhibition Working Party were pleased to announce the winner of their 2017 Poster Competition on the night. With a large number of entries, the Working Party selected four finalists with the winner being announced at the launch event. Miss Zoe Holmes, a seven year old Yorke Peninsula resident who entered the ‘local inspiration’ and ‘embrace art’ categories was thrilled to win the competition. 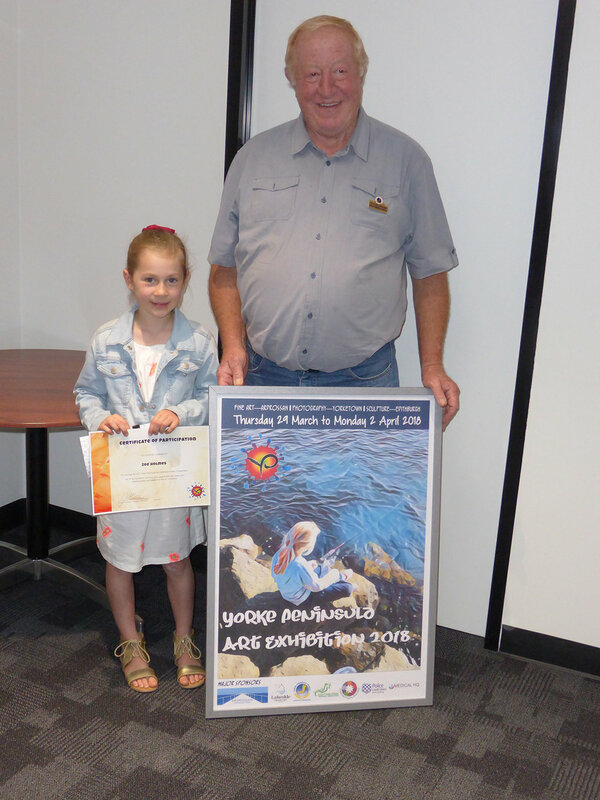 The young artist provided an image for the poster which depicted fishing at the Port Victoria boat ramp and reminded the young artist of having fun with her family. It was a wonderful and colourful representation of the Yorke Peninsula. Councillor Alan Headon, Chairperson of the YP Art Exhibition Working Party presented the winning certificate and a $250 gift card to Zoe.